vim, the final editor. Well, for some people at least. People like me, we like to type their files, code and more inside of dark-coloured windows, mainly terminals and do not really care if those files are local on their laptop, on the server at their feet or on some virtual node on a cluster in a data center around the globe which they don't even really know the location of. A lot of people think it's weird and a little bit daunting and steer clear from it. Others just miss functionality from their favourite IDE. vim has a lot of functionality already built in, which is worth exploring in itself. Apart from that, it is extensible, something people take advantage of by creating extensions with nifty extra things. # arbitrary sources like files, buffers, recently used files or registers. The airline.vim page has a nice list of plugins. Some of these are signify, bufferline, tagbar.vim, unite.vim, CtrlP.vim. 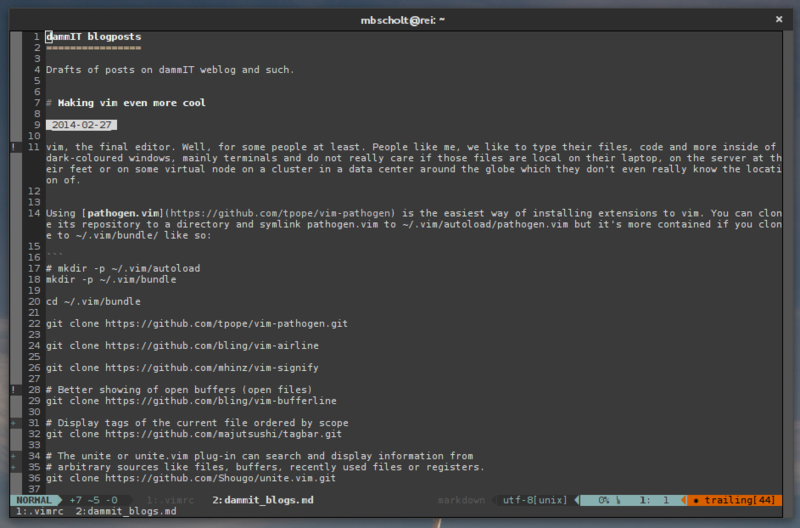 A simpeler version control gutter is gitgutter, which can be your choise if all you use is git. Update 20140304: I found Vundle which makes installing bundles even more simple. Be sure to check it out. Install the Zenburn colour scheme for some nice colour highlighting: git clone https://github.com/jnurmine/Zenburn.git and symlink or copy the zenburn.vim file to ~/.vim/colors. This also works in the Pathogen way, so you can also just clone that repository into ~/.vim/bundle and be done! if &term == "xterm" || &term == "screen-bce"
To get the nice fonts in the airline bar at the bottom, get the Powerline repo and use its fonts. In some directory (temporary if you like), do a git clone https://github.com/Lokaltog/powerline.git. Copy powerline/font/PowerlineSymbols.otf to ~/.fonts/ (or another X font directory, like a system-wide /usr/share/fonts/truetype/Powerline). Run fc-cache -vf ~/.fonts to update your font cache (fc-cache -vf /usr/share/fonts/truetype/Powerline). Move 10-powerline-symbols.conf to either ~/.fonts.conf.d/ or ~/.config/fontconfig/conf.d/ or the system-wide /etc/fonts/conf.d/, depending on your fontconfig version. Read more on the Powerline fonts.